Here is my foyer decorated for Halloween .. The stair railing has leaf and berry garlands with lots of little wooden Halloween signs..
My favorite Halloween stitching Prairie Schooler When Witches go Riding is on display here ..with Hands on Design A year In Chalk for October..vintage scale and some sweater pumpkins finish off this vignette..
Also this Lizzie Kate Tingles that I finished last year and mounted on fence pieces that I had cut down. 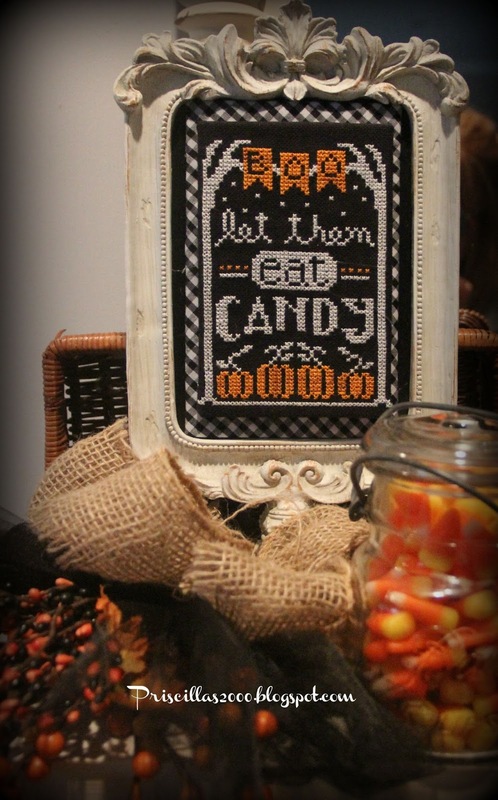 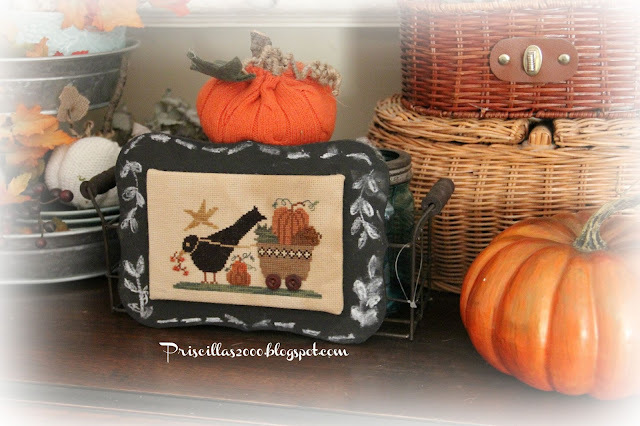 I finished stitching up Octobers A Year In Chalk from Hands on Design this weekend..Isn't it c-u-t-e! 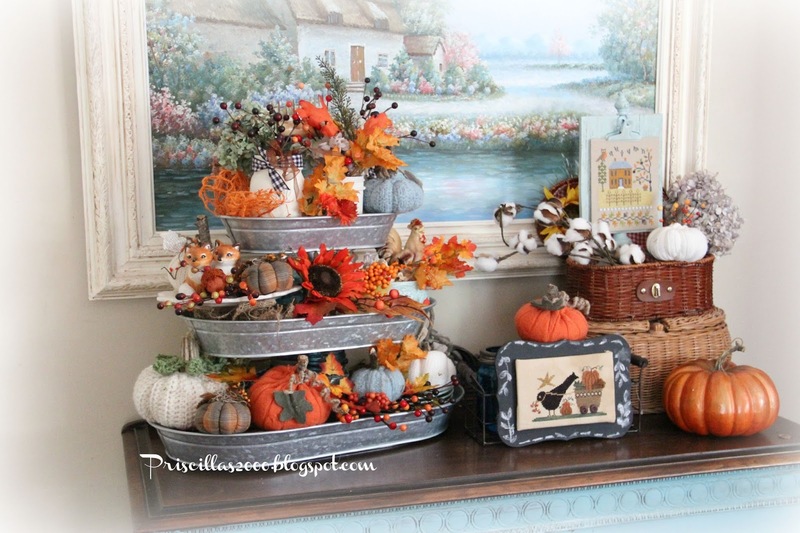 It is in the foyer which I will show you all of tomorrow..
We finally got to go pumpkin picking on Wednesday this week..We were supposed to go last Saturday but there was too much rain the night before so they didn't open the patch .. I only ended up getting 87 pumpkins this year ! But it is enough ! 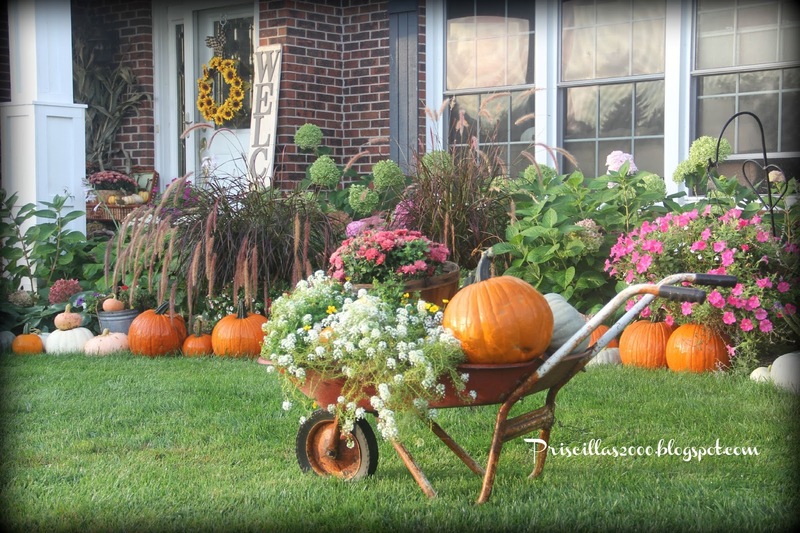 Lots of white and blue and the peachy pink ones ..
We have them as always lining the front flower beds ..on the porch and in the vintage wheel barrow..
and why couldn't that red grass pick itself up and look pretty for my pictures ! LOL! 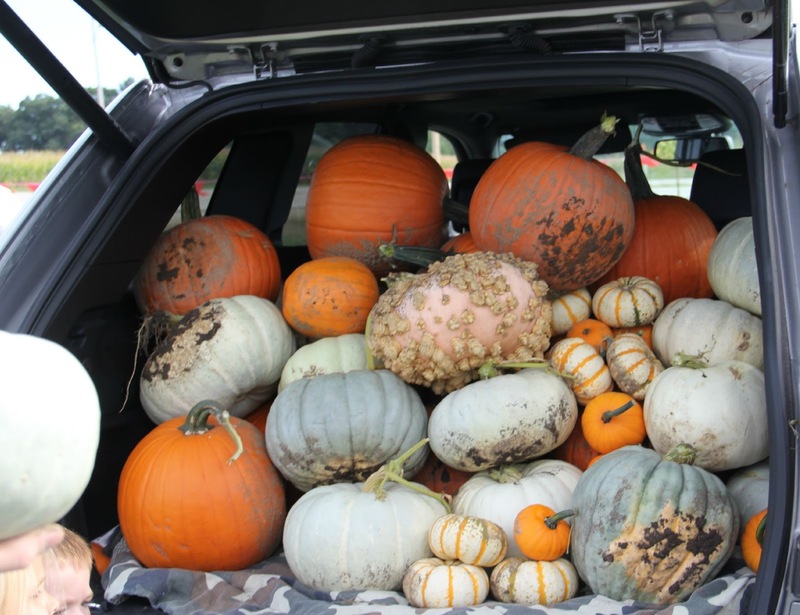 Can I tell you how much I love pumpkin picking day ! 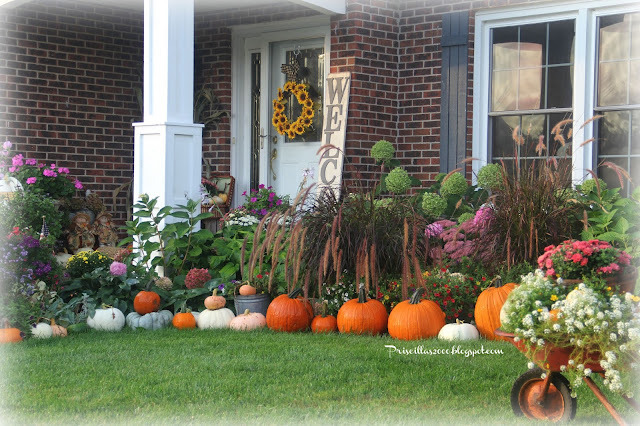 We are off to the airport to go see our #91 play football at Penn State ..so excited! 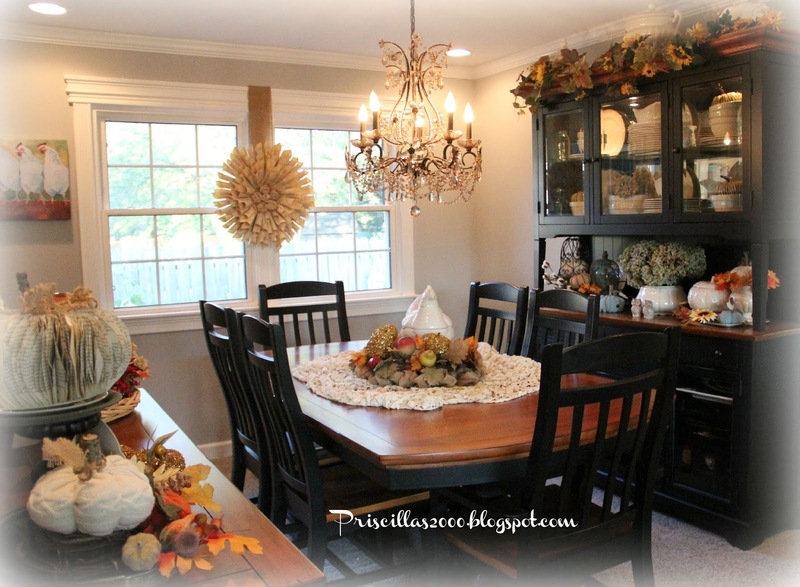 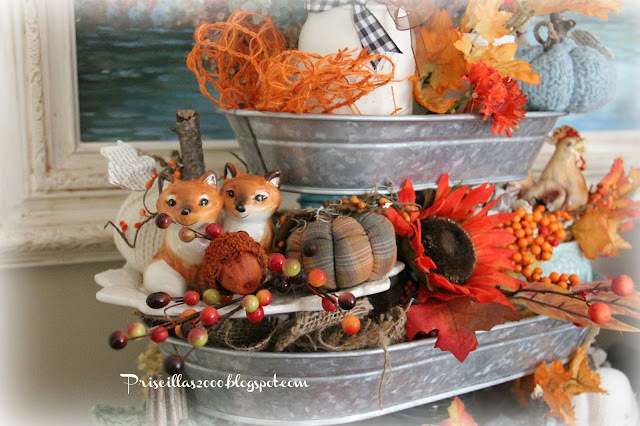 In our family room I have decorated the Aqua buffet and also the side table with Fall .. I have another galvanized 3 tiered tray that sits on the buffet and it is now full of Fall! 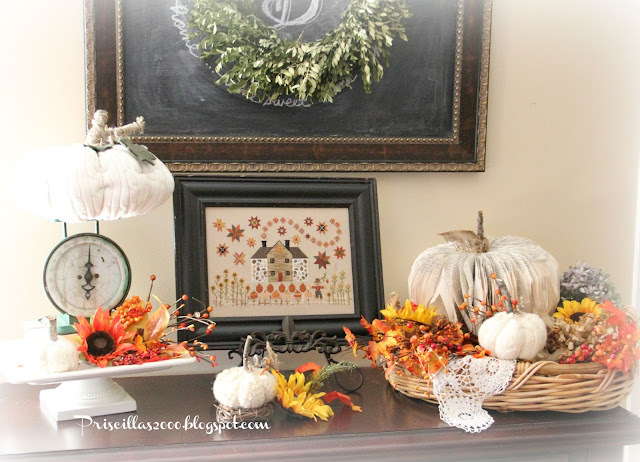 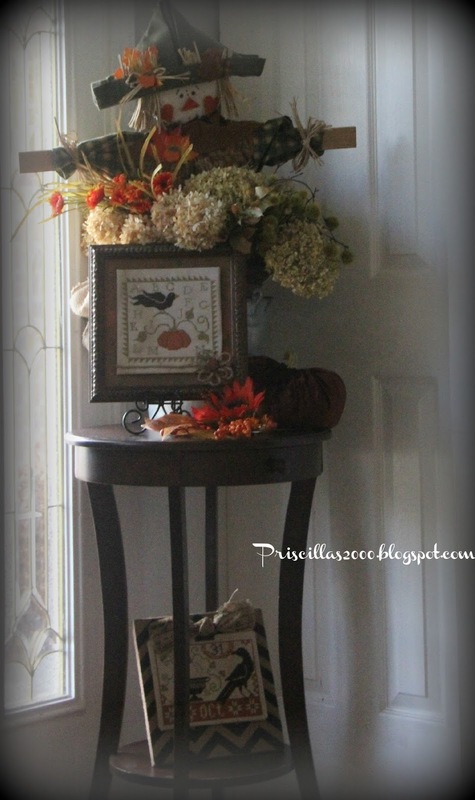 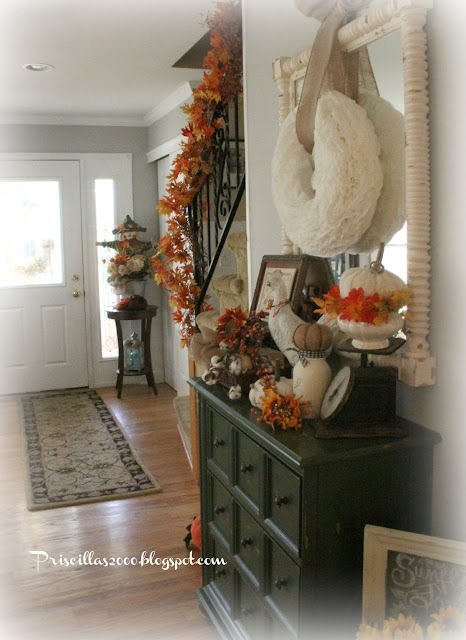 Fall florals and leaves, sweater pumpkins, painted mason jars.. fall berries are all in that tray..Thrift store baskets hold dried hydrangeas, a faux cotton branch , sweater pumpkin and the pedestal framed stitchery. Look at these cute little foxes .. 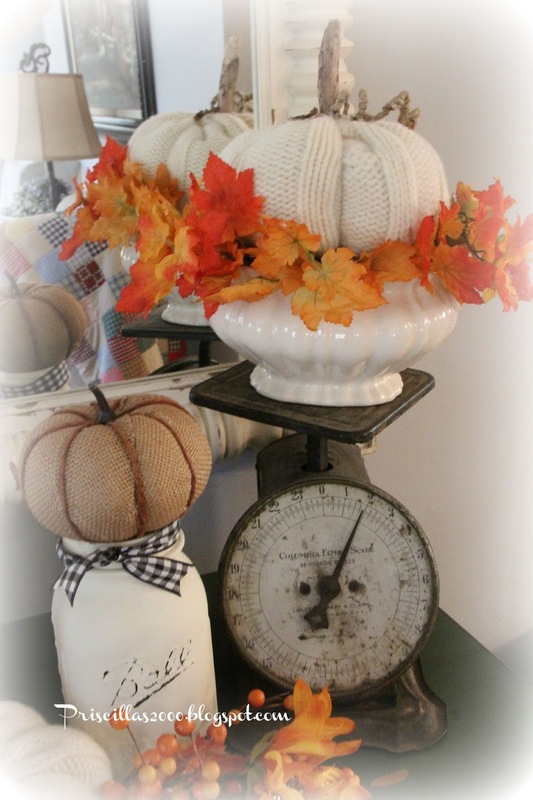 They are from BHG at Walmart..Love them! 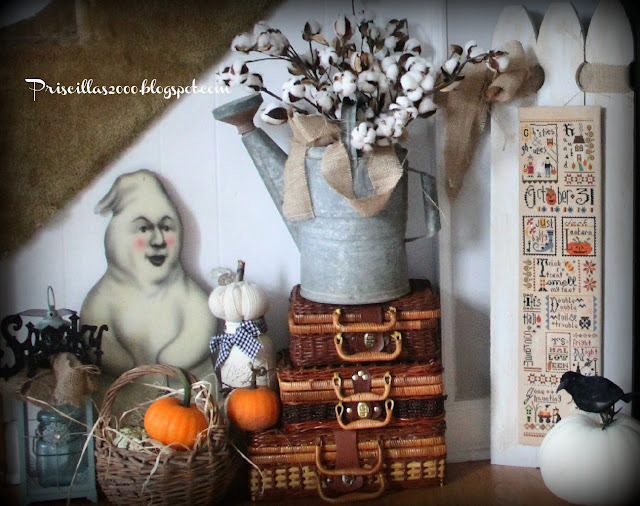 The chicken is vintage from a flea market. A little stitched piece mounted on a chalkboard..
Lizzie Kate 4 seasons.. 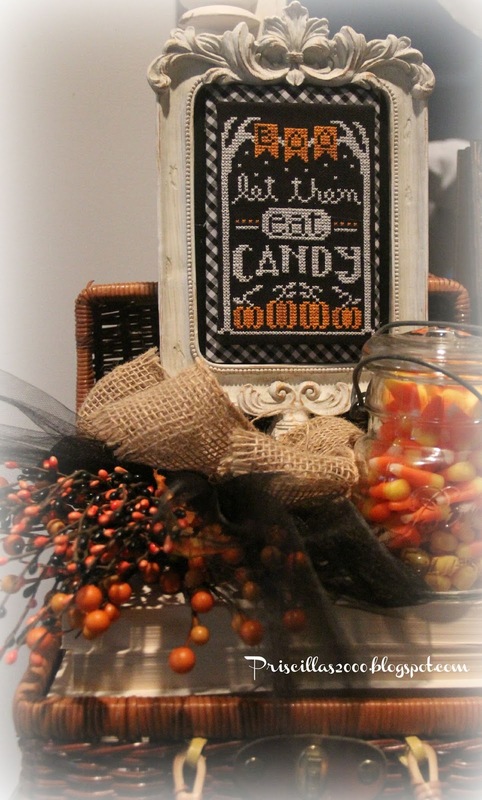 Mounted on a clipboard frame from Michael's.. 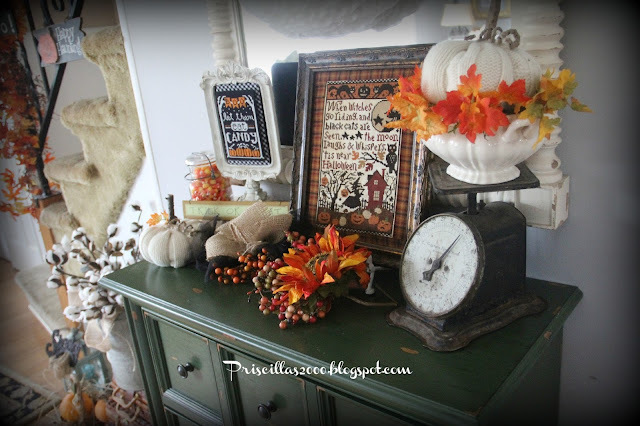 Plum Street Samplers Cinnamon Stars sits on the side table..a DIY book page pumpkin and more sweater pumpkins.. I think this is my favorite Fall stitching! 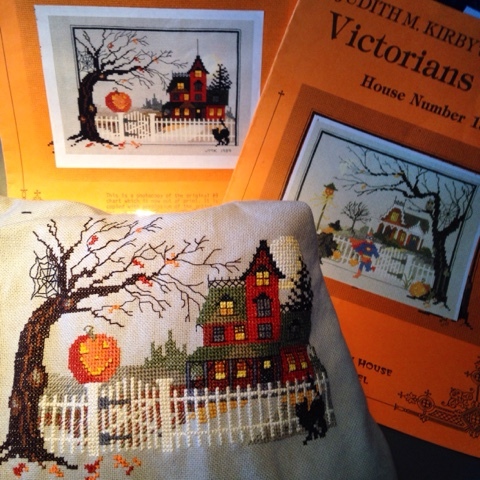 Last Friday we took off for San Francisco ..I stitched my way there on this Judith Kirby Halloween Victorian .. 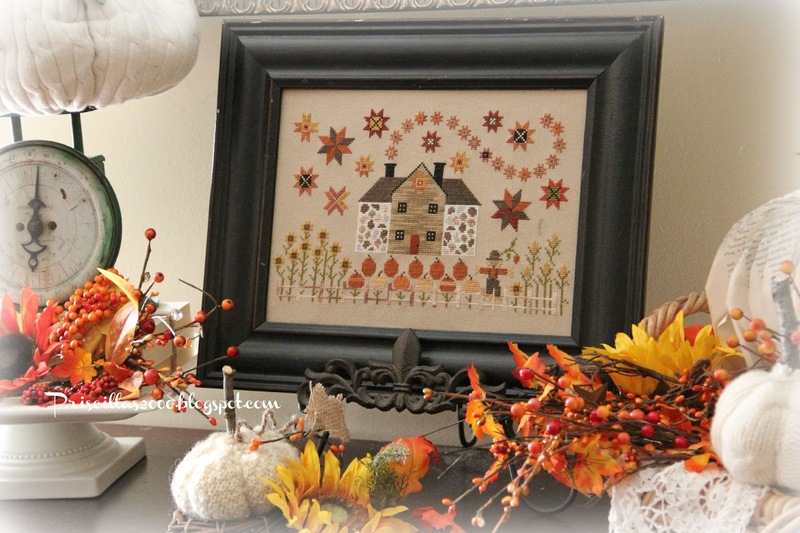 I finished the first part , I am stitching the 2nd chart with it as one piece. 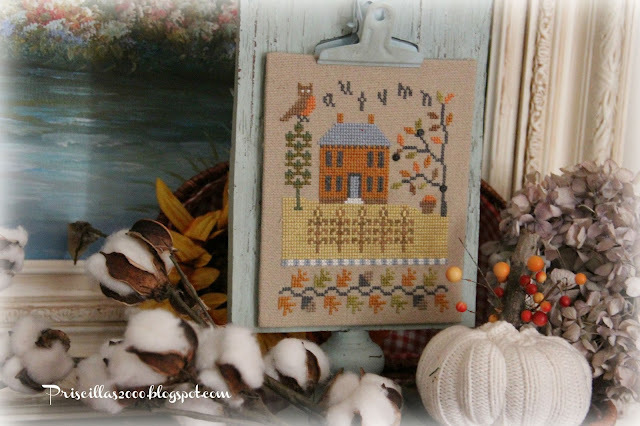 I saw after I took this photo that I missed the backstitch on top of the house :) I am stitching it on a light blueish grey 28 count Monaco that I tea/coffee dyed ..I have had these charts for so long and this one didn't take very long to stitch up! 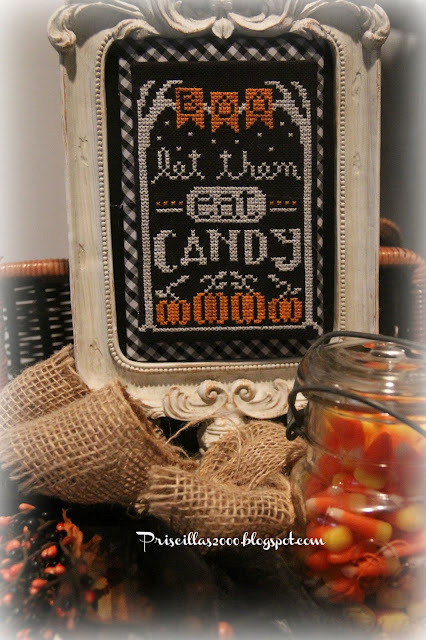 I don;t think I am doing the border, I will wait and see after I finish the second part. 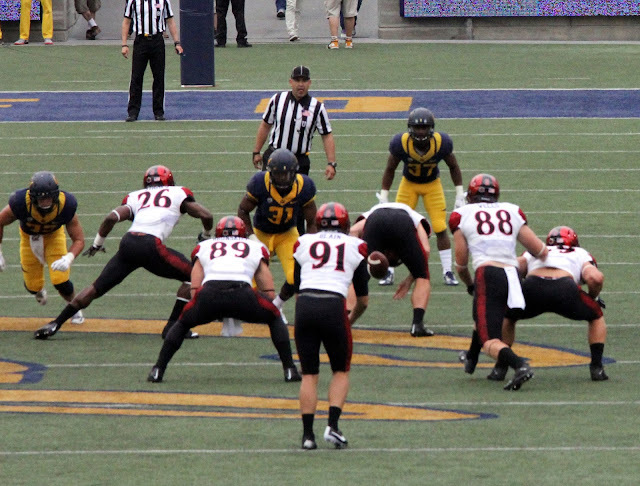 On Saturday we went to see our #91 play his second game this year as the punter for San Diego State University..They played in Berkley at Cal State. 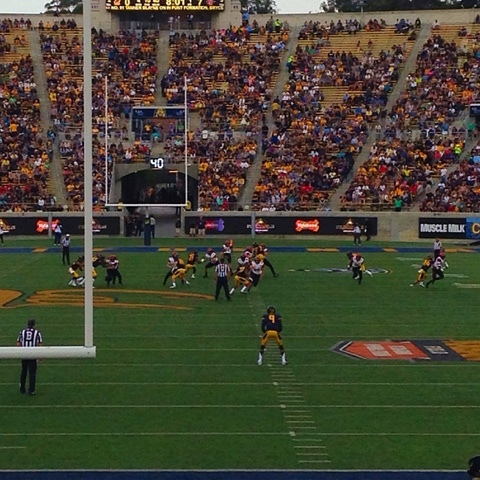 They started out winning their game but then lost ( by alot) ..But it was great to see him and see him play ..I can't even tell you how exciting it is to see your son play college football!! Looking forward to next weekend when we are traveling to Penn State to watch another game ! 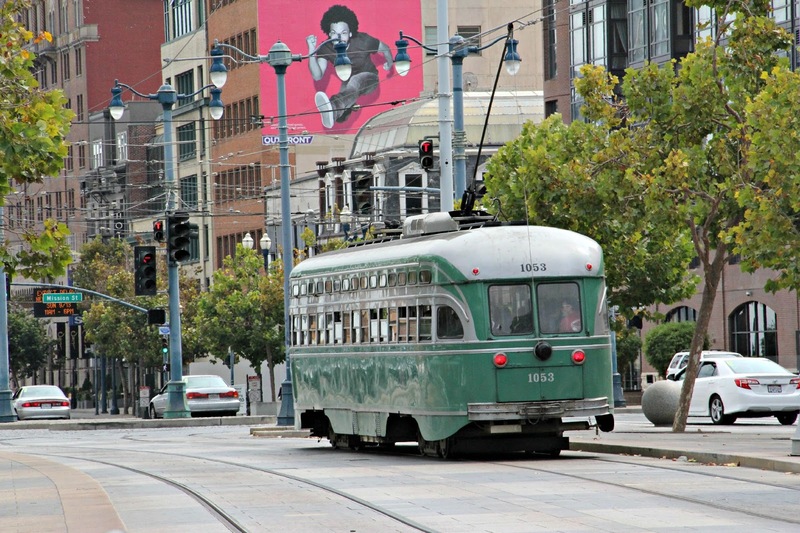 Sunday we went to San Francisco ..we stayed in Oakland at the hotel the team stayed at . We ended up taking the subway to both the game in Berkley and San Francisco .. That was a little interesting :) But it did work out great! 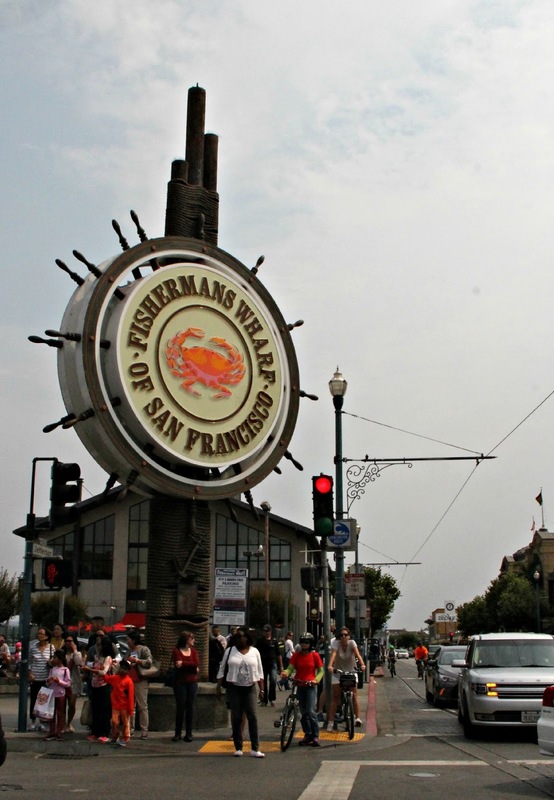 We went to Fisherman's Wharf.. The Ferry Market, Ghiradeli Square..We walked and walked and walked some more ! 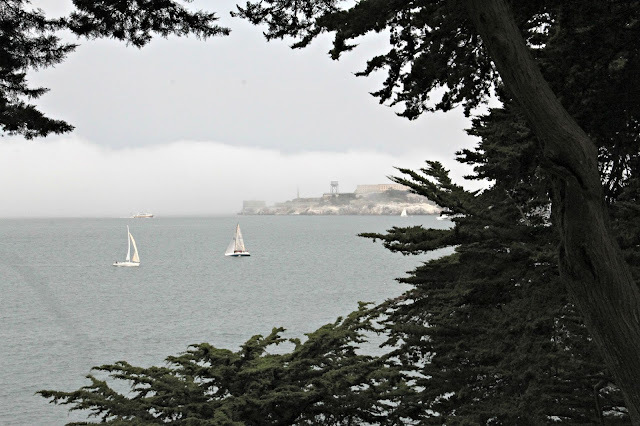 This was our view at lunch .. 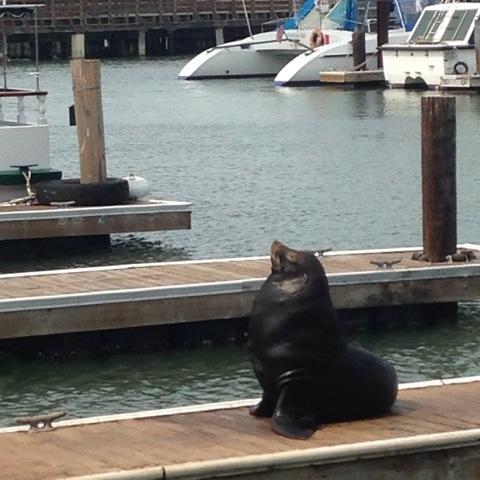 He /she was sunbathing on the dock ..
We then went back to the hotel and got our rental car and drove over the Golden Gate Bridge.. 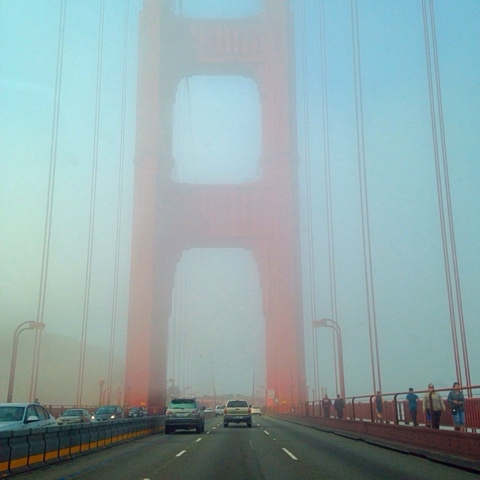 It was so foggy ..but very pretty! 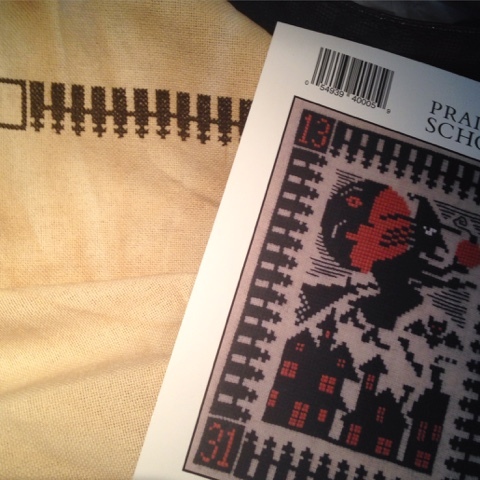 Our plane left for home at 5am Monday so I didn't stitch very much.. but I started on this Prairie Schooler Halloween .. 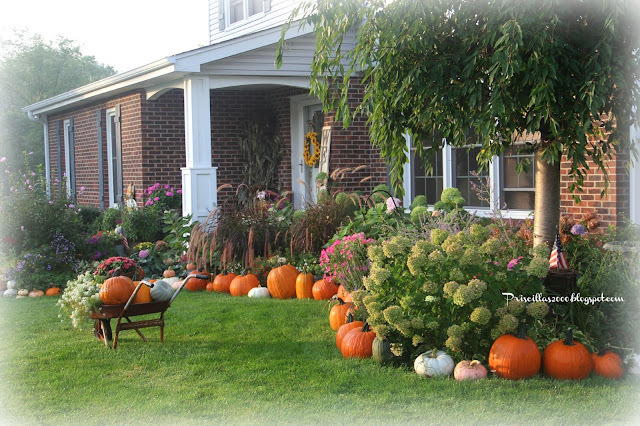 Since we don't go pumpkin picking til this Saturday ( Yeah! 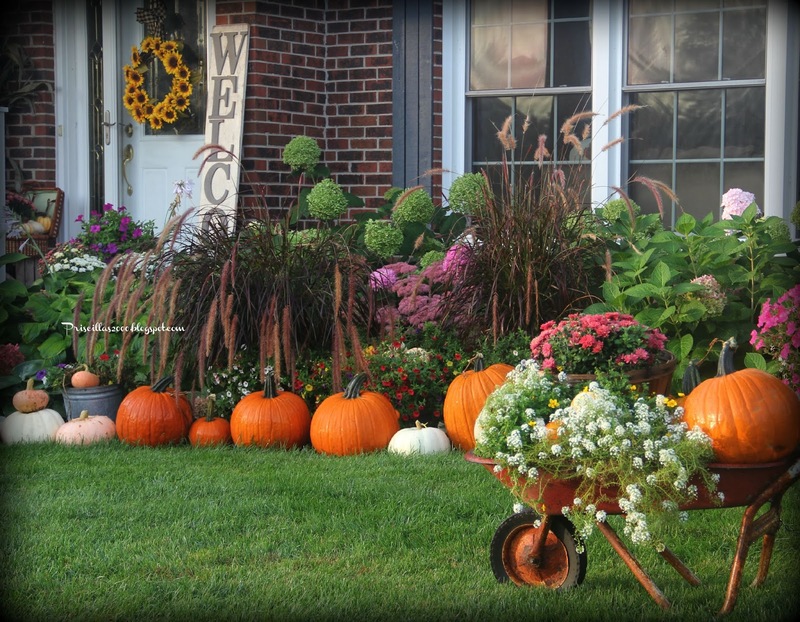 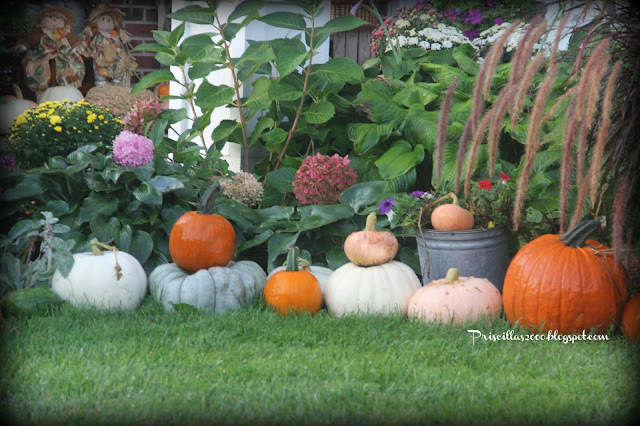 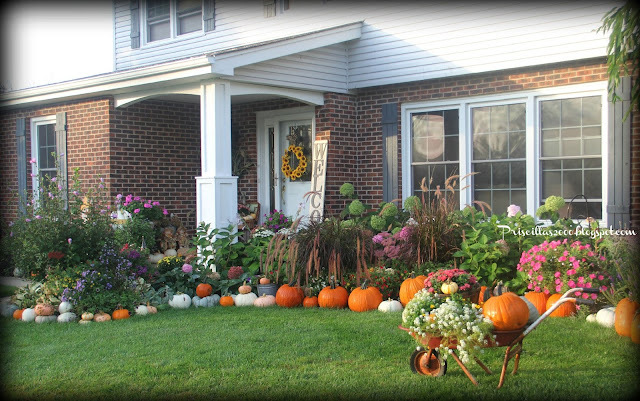 2 days until pumpkin picking :) the above image is last years pumpkins winding around our front flower beds and porch ..It is a big family tradition to go pumpkin picking and we buy them by the carload.. If you are here from http://www.houseofhawthornes.com/ You are at the right place! 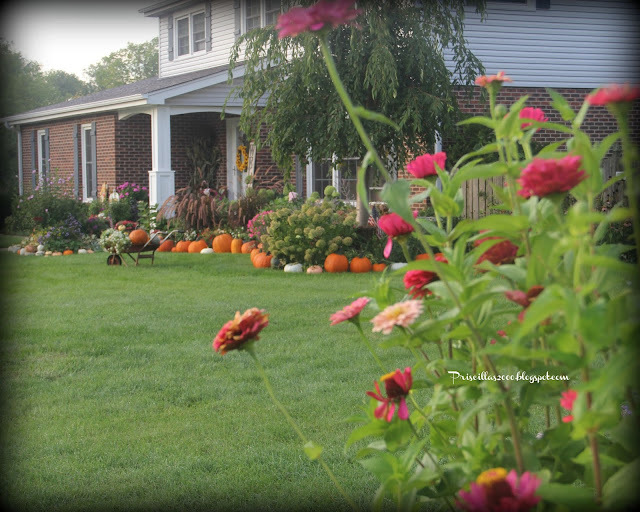 Come on in ! 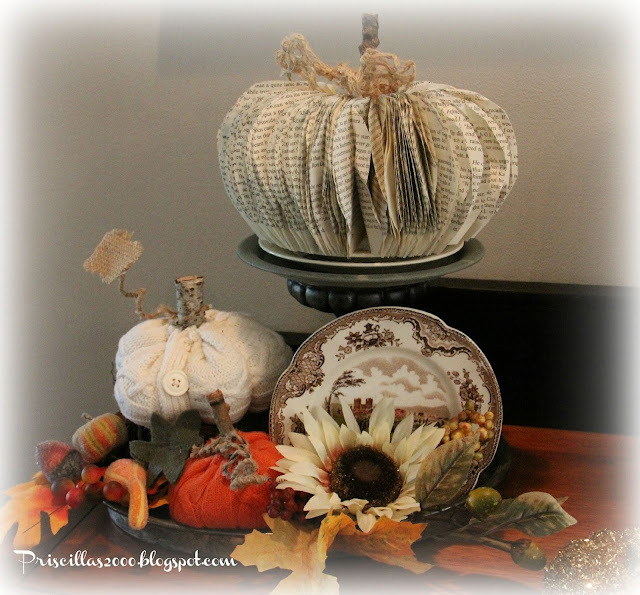 I decorate with a lot of vintage and thrifted pieces.. 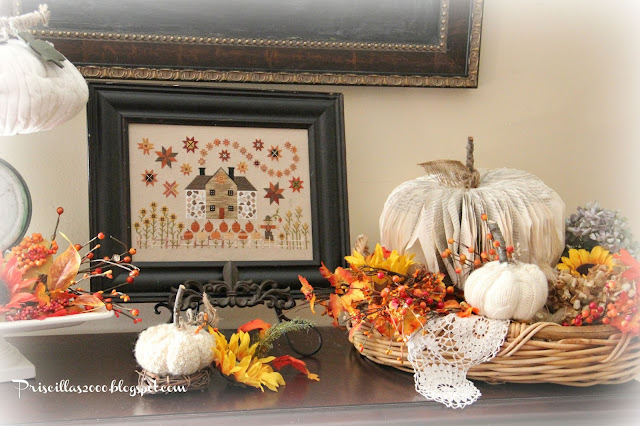 I also love DIY projects and stitchery pieces.. 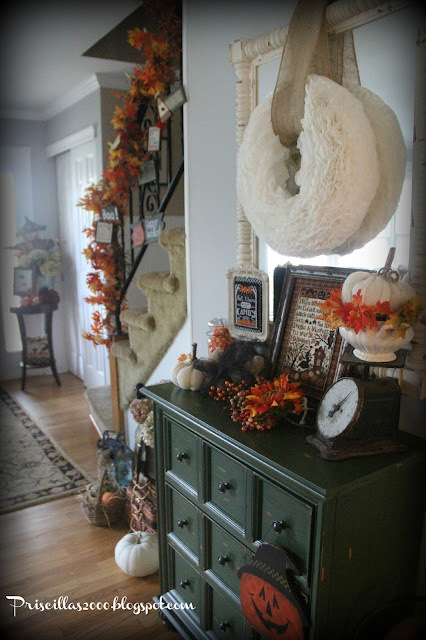 In the foyer , the stairs are decorated with leaves and berries .. A scarecrow sits in a galvanized bucket full of dried hydrangeas by the front door..
sweater pumpkins, a vintage scale , painted mason jar, and burlap pumpkin..There is also a wicker picnic basket with fall florals and a cotton branch surrounding a fall stitched piece.. 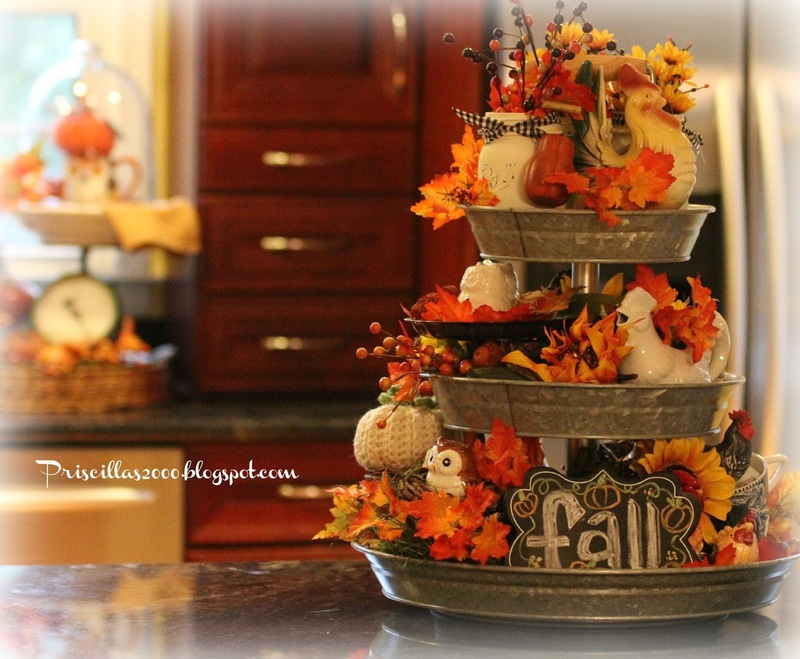 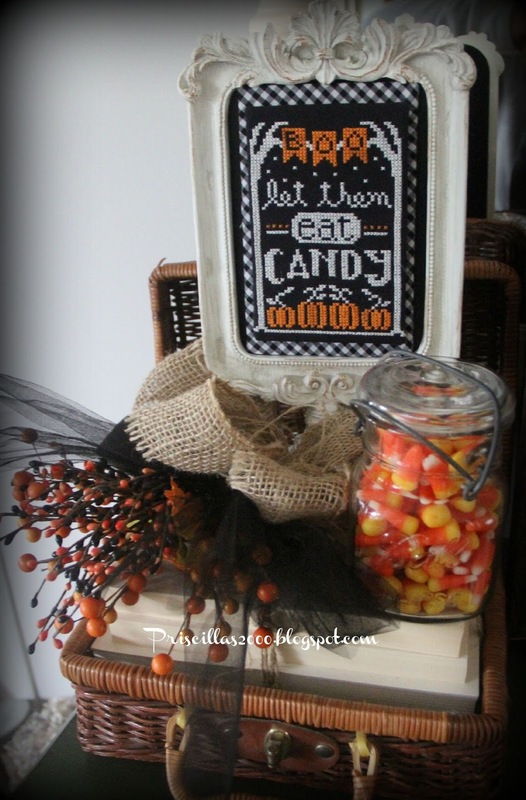 In the kitchen you will find one of my favorite pieces to decorate seasonally , the 3 tiered galvanized tray.. 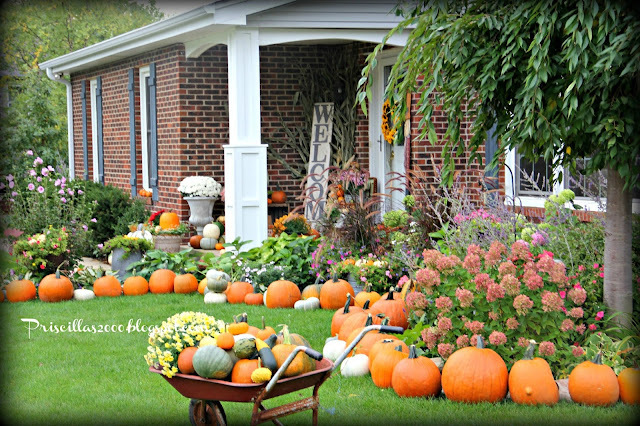 It is full of Fall! 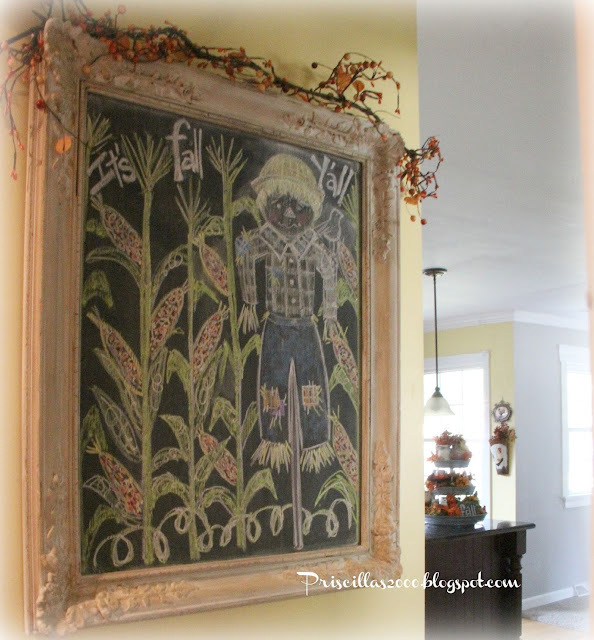 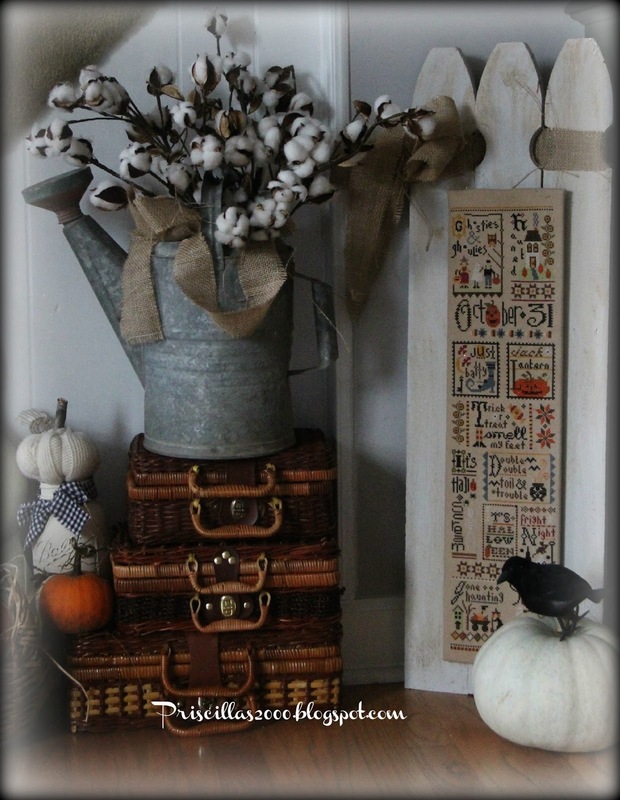 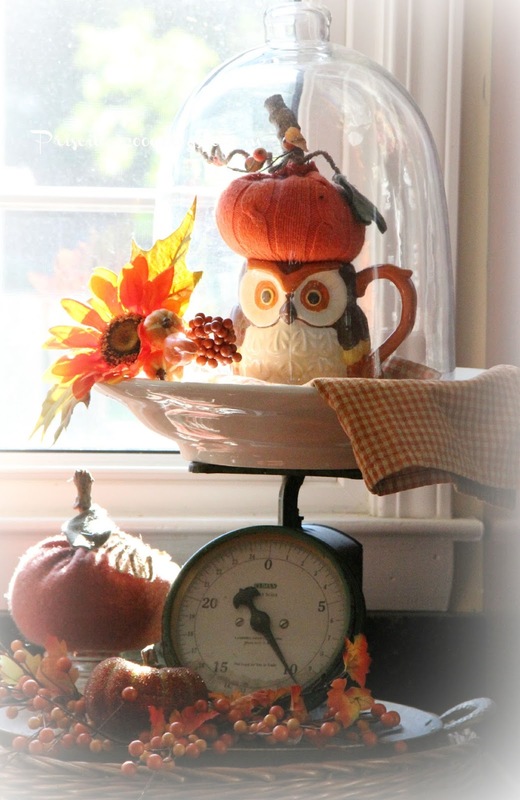 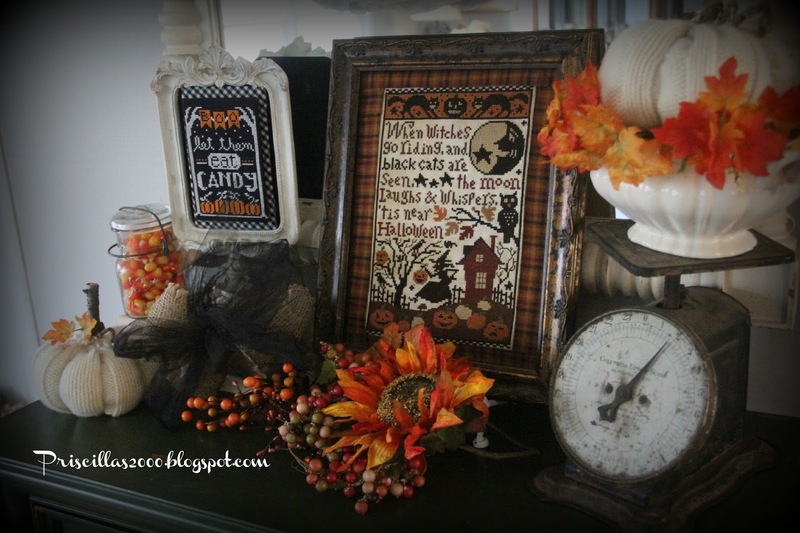 The seasonal chalkboard is also in the kitchen and it is decorated with a corn patch and a scarcrow..
Another vintage scale , cloche and sweater pumpkins sit on top of a owl mug.. 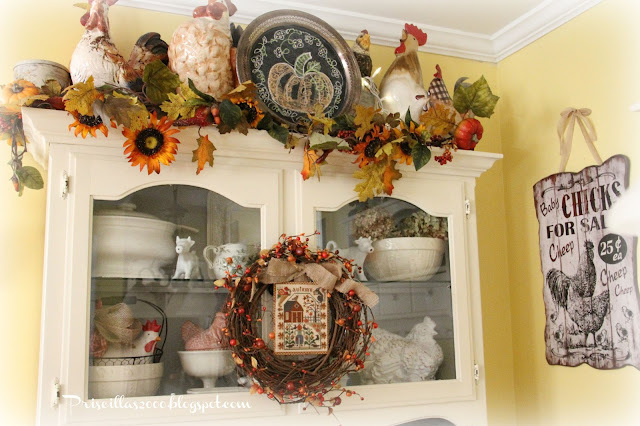 The top of the hutch is decorted with another seasonal chalkboard ..this one on a silver tray , a fall garland surrounds the chickens..a stitched piece mounted in a wreath hangs on the door.. 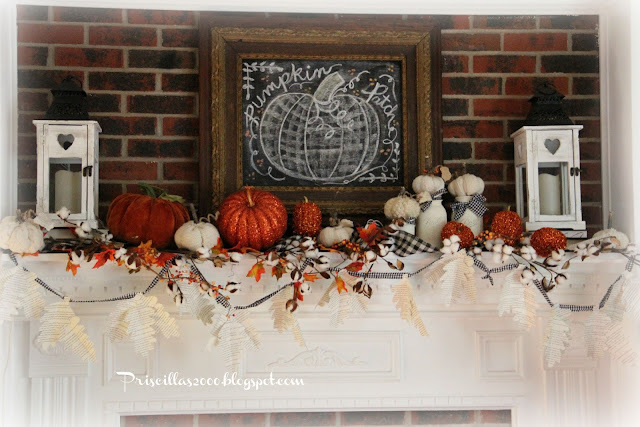 In the family room , the mantel is decorated with a vintage frame turned chalkboard.. book page garland, faux cotton branches, lanterns, and glittery pumpkins and white sweater pumpkins..
Another galvanized tiered tray in the family room hold more fall goodies.. several stitched pieces , cotton branches and of course sweater pumpkins are in this fall vignette..
Another stitched piece ..sweater pumpkins and a book page pumpkin sit on this table in the family room.. 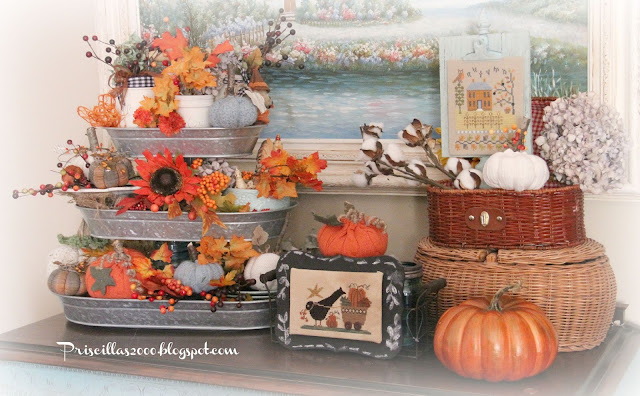 The dining room hutch has a sunflower garland on top.. thrift store soup tureens ..book page pumpkin ..transferware , sweater pumpkins all are used to decorate the room.. 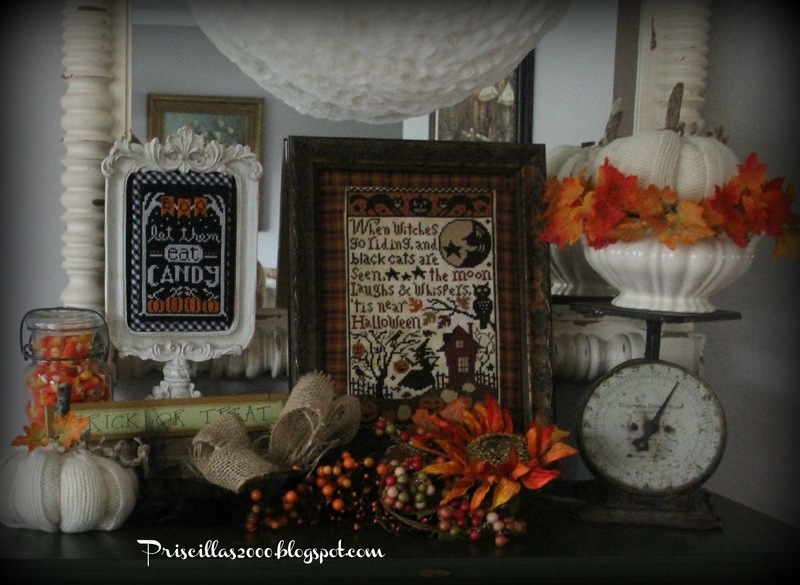 Thanks so much for coming by ! 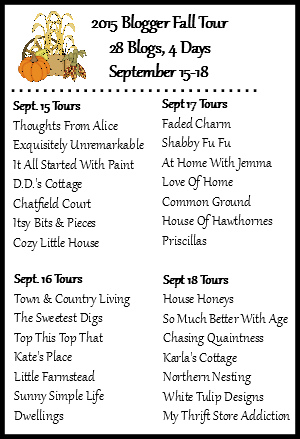 Since I am the last for today ..tomorrow the tour starts back up with www.househoneys.com and here are all the blogs participating..